We love our French girl style, but the baguette-toting, beret-wearing country does not hold a monopoly on chic interiors (all due respect to Caroline de Maigret). Travel a skosh to the south of Paris, and you’ll find a world of breezy inspiration to the tune of the Mediterranean: Rustic whites, perfectly-imperfect wooden accents, vibrant pops of color, and charming antiques abound in the sunniest part of Europe. Between cool Spanish style paying homage to the country’s history and the classic seaside elegance of the Greek islands, there’s a lot to covet from this region. Read on to discover some of our favorite elements of Mediterranean style—plus, how to bring this aesthetic home, even in the smallest ways. 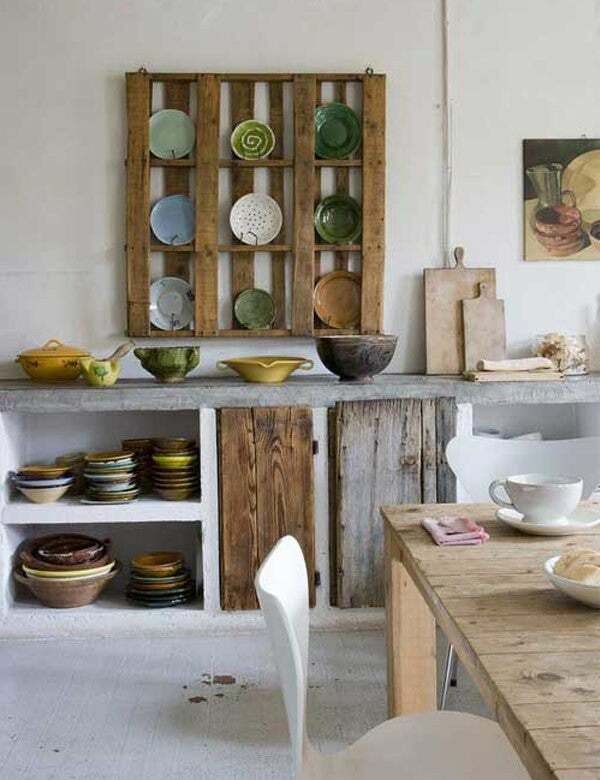 Not all kitchens are blessed with this much open space in which to display artisanal plates, but the standout piece here is this cool alternative to open shelving Try hanging an old wooden crate to use as extra storage space. Bonus points for artfully arranging an eclectic collection of vintage dinnerware. This idyllic scene belongs to Capri Suite, an Italian hotel situated just off the Amalfi Coast. Suffice it to say we’re taking our fair share of styling tips from this breakfast nook set up, starting with the mismatched dining chairs and ending with shades of electric citron—which pay homage to all the lemon trees lining the Mediterranean—that pepper the space. This little vignette looks like it’s part of a kitchen, but the tile-on-tile look can be replicated anytime, anywhere. Try your hand at the monochrome trend in one of the hardest to decorate spots of any house: the bathroom. In lieu of painted walls, choose a brightly hued tile to extend from the floor all the way to the walls for a bold look. The cardinal rule of Mediterranean style? When in doubt, go simple. Whitewashed homes accented only with a few carefully selected accessories, like this woven basket or brass antique mirror, are a trademark of the area. Statement lighting is having a moment, so try swapping out the contemporary brassy fixtures everyone and their mother has (you know the ones) for a natural option, like these gorgeous pendant lights by Alux Design. Honorable mention in this photo goes to the collection of hand-blown glass vases, all that’s needed to bring some interest to the empty wall space. The picture of Italian villa living, Hotel Monteverdi Tuscany is a lesson in sophisticated design all’Italiana. Here, a more modern color combo of green and pink (the latter of which veers dangerously close to millennial pink, it must be said) is offset by rustic wood beams and more pared back decor, allowing the colors to truly take center stage. Where traditional Greek island homes are typically devoid of any wall color, they bring in bright hues via the doors and windows. Choose a classic sky blue for a Cycladic feel in your own home, no matter what your zip code is. One thing you won’t find in coastal Mediterranean homes? Velvet mid-century sofas. Swap out that decidedly Western (and maybe even overdone?) trend for something more casual, like a clean-lined daybed or sofa with cushions in simple, breezy fabrics and a sleek wooden frame. Anthropologie’s Kalmar Sofa is a great option on the market right now—particularly perfect for smaller spaces, given the attached end table for extra surface space. While this stunning home is actually situated in Ojai, California, you would be forgiven for thinking it’s a product of southern Spain—maybe minus the mounted animal head. High, arched ceilings lend an airy feel, while large doors facilitate the indoor-outdoor feel many holiday homes in the Mediterranean are known for. This impeccably designed space is proof you don’t need a palatial, spa-like bathroom. The concrete trend is alive and well in the cool table used in lieu of a pedestal sink A mix of linen towels extend the natural vibe.